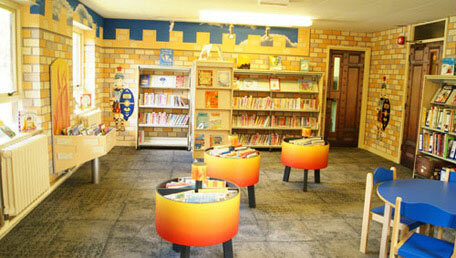 Working with FG Library's in-house design team, the client was involved at every stage of development. The new library space needed a complete overhaul in terms of decor. The challenge was to create an impactful fully themed space combining decor and furniture. It was essential that the space caught the imagination of its young clients whilst embracing local heritage. An archway was built to create a castle entrance in keeping with the Roman theme. Hard wearing and durable wallpaper was designed to cover walls and doors to reinforce the theme. On one wall graphics were applied to give the illusion of the Northumbrian valley over the castle wall. Themed bespoke kinder boxes were combined with standard shelving. Stone effect floor tiles completed the look.